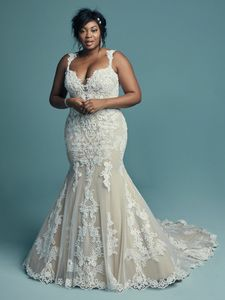 Description: This elegant fit-and-flare wedding dress offers additional coverage to our Abbie style, featuring embroidered lace motifs and crosshatching dance over tulle. Chic lace straps glide from the illusion plunging sweetheart neckline to the scoop back, all accented in beaded lace motifs. Lined with shapewear for a figure-flattering fit. Finished with covered buttons over zipper closure.